Thai Paradise slot machine is a Thailand themed game from Playtech, that whilst being focused on mobile slot play doesn’t necessarily Singha to us. The game is a 5 reel title with 15 paylines, and has a RTP of 94.99%. There is one bonus feature which is a free spins round offering up to 10 free spins. So, if you fancy a Thai adventure, read the full Thai Paradise slot review below for all the details. If your mental picture of Thailand is one of crowded street markets and gap year students “finding themselves” at full moon parties, Playtech has the perfect slot to show you the country’s calmer side. Appropriately named the Thai Paradise slot, this simply-designed, mobile-only slot features five reels and 15 paylines set in front of a calm blue ocean. Pink orchids appear at the top left and right of the screen, while unique symbols to feature on the reels include a Thai woman with a flower in her hair, a white elephant, a wooden ship and an ornate temple as well as hugely stylised Ace-to-10 placing card values. 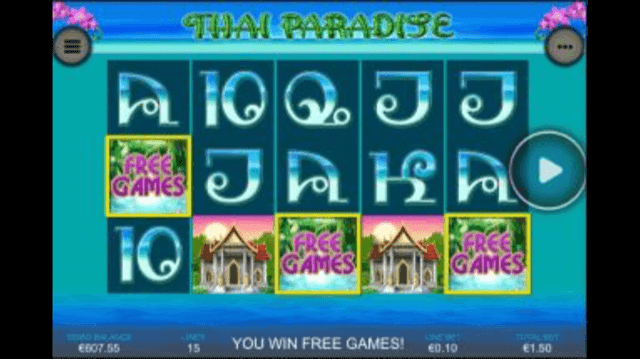 Playable from as little as £0.15 per spin with all paylines enabled, the Thai Paradise slot machine features a top base game jackpot of 5,000x players’ bet per line amount, which is awarded for landing five of the aforementioned Thai woman symbols on a valid payline. Aside from that, the slot also includes a relatively run-of-the-mill bonus feature that can be used by players to increase their overall earnings. The bonus feature in question is a free spins game that is activated whenever players land three or more orchid scatter symbols anywhere in view. Whenever this happens, they’ll be awarded 10 bonus games during which one regular icon will be chosen at random to become an extra scatter symbol. Not only will this scatter symbol now work in exactly the same way as the regular scatter symbol – that is to say, awarding an automatic payout any time three or more appear – but it will also help players to hit additional free spins and prolong the bonus feature indefinitely to improve their wins. Aside from this bonus feature, however, there’s not an awful lot going on in Thai Paradise. While that may be perfect for some players who are looking to get away from the cluttered design and overly complicated features of modern slots, it probably won’t appeal to those used to high-octane action. The Thai Paradise slot comes from an era when mobile games featured a minimalistic design out of necessity rather than choice. As this is no longer the case, unfortunately it leaves the slot looking rather dated. For a rather batter Thai themed game, why not try Thai Flower. Like our review of the Thai Paradise slot machine? Check out these as well…..